If you could see stars and planets from outer space, both would shine steadily. But – from Earth – stars twinkle while planets (usually) don’t. Why? Astronomers use the term ‘scintillation’ to describe the twinkling of stars. Illustration by Tom Callen of the Cosmonova theater in Sweden. Stars twinkle. Planets shine steadily. Why? Stars twinkle because … they’re so far away from Earth that, even through large telescopes, they appear only as pinpoints. And it’s easy for Earth’s atmosphere to disturb the pinpoint light of a star. As a star’s light pierces our atmosphere, each single stream of starlight is refracted – caused to change direction, slightly – by the various temperature and density layers in Earth’s atmosphere. You might think of it as the light traveling a zig-zag path to our eyes, instead of the straight path the light would travel if Earth didn’t have an atmosphere. Planets shine more steadily because … they’re closer to Earth and so appear not as pinpoints, but as tiny disks in our sky. You’d could see planets as disks if you looked through a telescope, while stars would remain pinpoints. The light from these little disks is also refracted by Earth’s atmosphere, as it travels toward our eyes. But – while the light from one edge of a planet’s disk might be forced to “zig” one way – light from the opposite edge of the disk might be “zagging” in an opposite way. 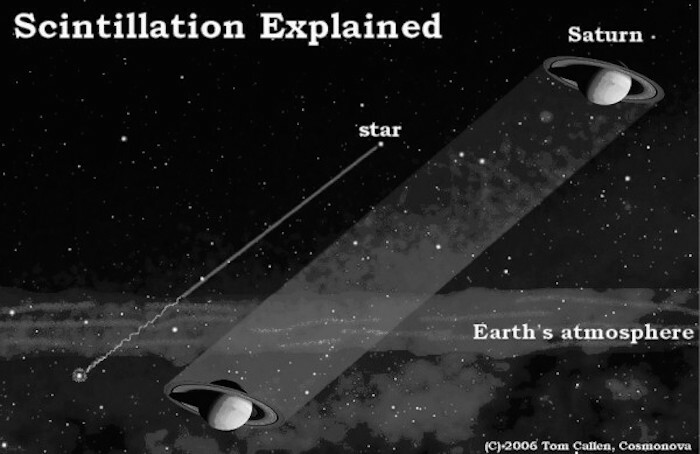 The zigs and zags of light from a planetary disk cancel each other out, and that’s why planets appear to shine steadily. Stars, or planets, twinkle more when you see them low in the sky. That’s because then you’re seeing them through more atmosphere than when they are overhead. Illustration by AstroBob, via The Random Science blog. 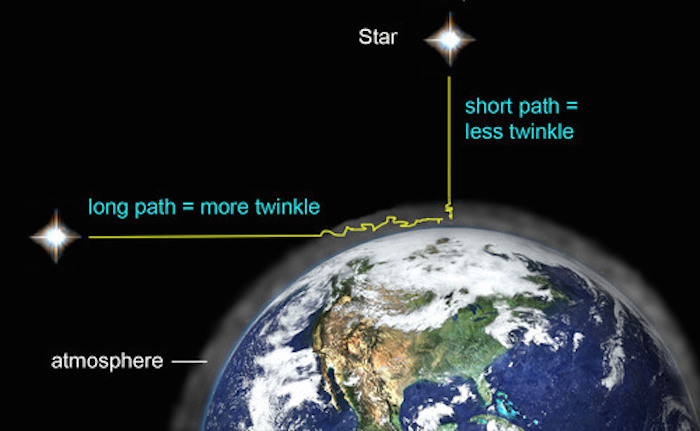 You might see planets twinkling if you spot them low in the sky. That’s because, in the direction of any horizon, you’re looking through more atmosphere than when you look overhead. If you could see stars and planets from outer space, both would shine steadily. There’d be no atmosphere to disturb the steady streaming of their light. Can you figure out which objects are stars and which are planets just by looking for the twinklers vs the non-twinklers? Experienced observers often can, but, at first, if you can recognize a planet in some other way, you might notice the steadiness of its light by contrasting it to a nearby star.